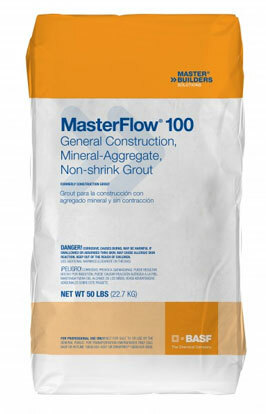 DESCRIPTION: MasterFlow 100 is a non-catalyzed, multi-purpose construction grout containing mineral aggregate. It can be extended with clean, well-graded coarse aggregate to fill large voids. MasterFlow 100 grout contains no accelerators, including chlorides or other similar salts, will not contribute to corrosion of reinforcing steel.